Hatters interim boss Mick Harford was pleased to get some game time into returning striker Danny Hylton during Town’s 3-0 win at Shrewsbury Town on Saturday. 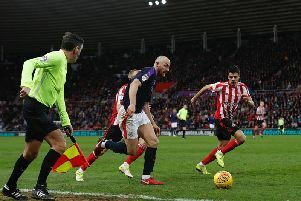 The 29-year-old had missed the last four matches after being sent off in the 1-1 draw at Sunderland on January 12, his second red card of the season. Hylton came on for Kazenga LuaLua with 20 minutes to go and Luton 3-0 in front, looking eager and hungry to make an impression, as Harford said: “We got some minutes into Danny, he’s obviously been out for quite a while. “We’ve kept him topped up fitness-wise and it was good to get Danny out there. “It would have been another good substitution if he’d have scored, but we’re getting a few of the players back now and the squad’s looking stronger. Hylton almost notched a sixth goal of the campaign with his first touch, sending a header goalwards, only to see home keeper Steve Arnold just about claw the ball away in time. Strike partner James Collins said: “I thought it went in if I’m honest. From where I was, I thought the keeper scooped it out of the net, but the lino didn’t give it. Town defender Matty Pearson felt it was a huge boost to have players like Hylton to come on and freshen the side up as they seek a second successive promotion. He said: “We have a big squad and you could see we had a few tired players out there with Macca (Alan McCormack) getting a little knock as well. McCormack, who went off after 77 minutes for Dan Potts, drew fine praise from Collins too, adding: “You don’t have a career like Macca’s had if you’re not a good player and he had big shoes to fill as well with Glen Rea getting injured. “Glen was arguably player of the season until he got his knee injury, but Macca’s come in and been outstanding. “He marshals that midfield, he’s good on the ball, knows how to play the game and knows how to see games out. "He’s a good mate of mine Macca and I’m delighted for him, as he’s been outstanding."